Let's talk cake. Of the chocolate variety, since there hasn't been one on this site yet and it's been over a month and that is just crazy. Exams are over. Yes. After a hellish week of sleep deprivation, countless midnight instant coffees and the overwhelming desire to start a bonfire with my textbooks, I've managed to survive yet another year of law school. Clearly, this calls for celebration. This usually means cake and alcohol. And I know you must be with me on that. So really, it was only a matter of time before combining the two. And since some culinary genius in another century had discovered the magical link between red wine and chocolate... well, obviously you can see what happened. Honestly, I'd been craving this cake for about a week before I made it. I was complaining about the misery in my life caused by stubbornly reaching way over my head in my choice of uni degree (#firstworldproblems) for about the millionth time to a friend and she told me she made a chocolate wine cake a few days ago. I love my friends. And then it stuck with me. It was like tying a feather to a string and pulling it along in front of a cat, then tugging it away just as it pounces. The words 'chocolate wine cake' floated in front of me like an unreachable feather toy while I agonized over whether a doctor could be held liable for his patient falling over a cliff and getting a leg chewed off by a shark (yes, really). I won't say my answer because it might be very wrong, but this cake is definitely very right. It's unbelievably moist with a velvety crumb, but surprisingly not very rich. The wine is clearly present but not overwhelmingly so. This is from one of my absolute favorite blogs: Smitten Kitchen (from which I've also made this cake), who clearly has amazing cake recipes in addition to good taste and a a killer assonant blog name. SK says that for her, this is the real red velvet cake, and I agree. 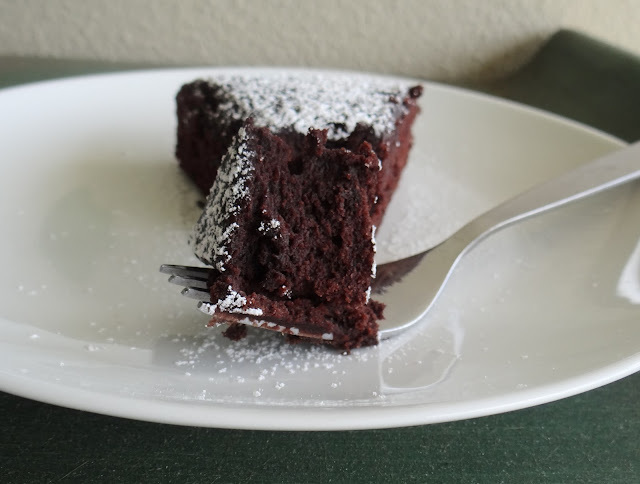 The cocoa powder gives the cake a natural red blush under the sun which is contrasted nicely with a dusting of icing sugar. Or you can choose to pair it with the mascarpone topping included in the original recipe, but I thought it was better plain (read: I was too lazy). So if you've been having a hard time in life lately, try this cake. It won't fix your problems, but it'll help you forget them for a little while. Which is what cake is all about, right? Note: I changed the sugar ratios slightly because I ran out of brown sugar midway through (such is the way of my organized life). I usually like to reduce sugar content in cakes, but I kept it roughly the same here - the acidity and bitterness of the wine means the cake really needs it, and the final product isn't very sweet at all. 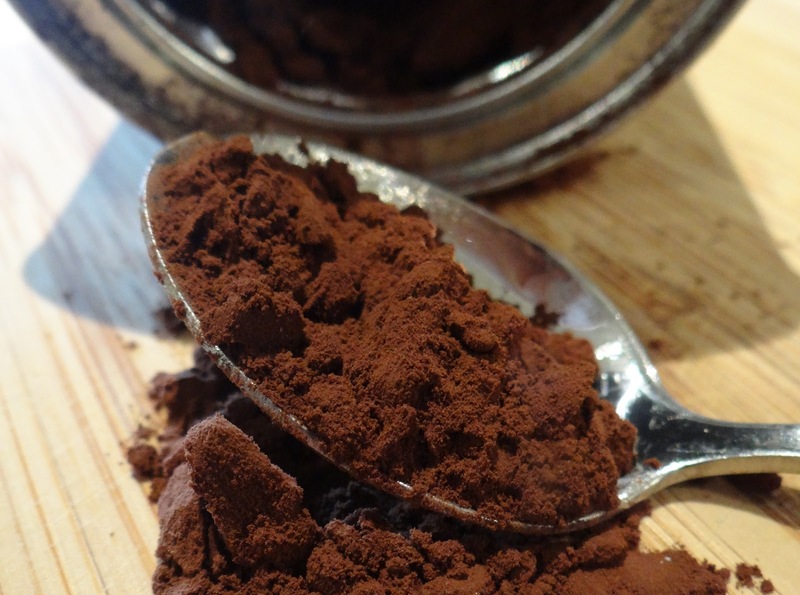 Try and use Dutch processed cocoa powder, because it really does make a difference. Preheat the oven to 160C/325F. Butter and line a 9-inch round cake pan. In a large bowl, cream butter and sugars until light and fluffy. Add the egg + egg yolk and beat till smooth, followed by wine and vanilla. If the batter looks curdled take a deep breath, make peace with your inner self and move on, it will be fine. Sift the flour, cocoa powder, baking soda, baking powder, salt and cinnamon straight into the creamed mixture and mix until just combined (as usual, don't over-mix!). Pour the batter into the prepared pan and smooth over with a spatula. Bake for 25-30 minutes or until a skewer comes out clean. Cool for about 10 minutes, take out of the pan and finish cooling on a rack. Dust with icing sugar and serve. I can't say that I've ever actually tried chocolate wine itself, I have no idea what that tastes like. But I promise this cake is much better!